Throughout the summer, Exeter University have been excavating a site at Ipplepen, near Newton Abbot in Devon. The site is being investigated by the university as an annual student training and community excavation and is part of the HLF-funded ‘Understanding Landscapes’ project. Jerry, from Cotswold Archaeology’s Exeter office, has been working with the university to help train students and members of the local community in archaeological techniques. This year, the excavations have yielded interesting settlement-related features of Iron Age and Roman date, as well as what may be part of a Christian cemetery: the graves were laid out on an east-west orientation, although they are yet to be firmly dated. 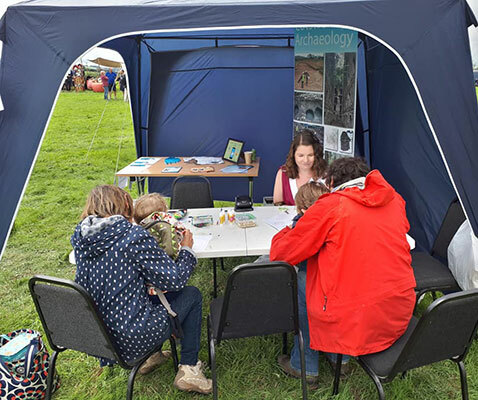 On Saturday 8th September, as the season’s excavations drew to a close, members of the public were invited to an open day at the site. 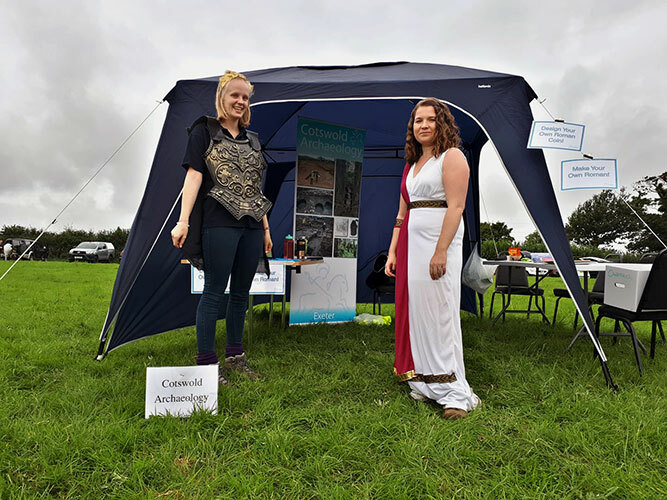 Staff from Cotswold Archaeology’s Exeter Office and Outreach team were on hand during the day to encourage visitors, old and young, to ask questions about what they had seen during their visit and learn more about the history of their village. Plenty of exciting activities were provided, and many families left contently with their own decorated Roman coins and split-pin Roman soldiers. Emily and Zoe went dressed for the occasion, but even they couldn’t match the clothes, weapons and armour of the Roman reenactors who took part in the day. The day was a great success and over 600 people took part in the site tour and visited the stalls. We all eagerly await the results of future excavations at Ipplepen, and look forward to learning about what else the site will reveal in years to come!